One More Month or Two in Bulgaria. So a little slow going with this blog lately, I have been very busy on my other sites and new blog. My websites will be all set up by the time I leave Bulgaria so I can just research and blog. If a person has an interest of what really is going on according to the New World Order agenda, other interests seem kind of shallow; but, most people find those subject to scary to indulge in, so some people will just submerge the subject. I am mostly in my last month here in Bulgaria, possibly heading out by April 15th, if I stay any longer it will only be one more month. The latest I will leave is in May. The time staying here has been great, just a natural flow of progression, and spiritually speaking, fantastic. Last November my neighbor butchered a cow and a pig and the above picture is the pigs head. Such a positive process than the corporate takeover such as in America. 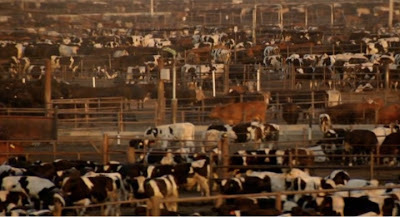 The cattle ranches (the below picture) pack the cows in and area where no grass will grow and they are added growth hormones to accelerate the growth of the cow, very sick. I have been contemplating about what I should do with this blog. I will not have time to focus on writing as much as before about the lame subject of travel. It could just come down to a photo blog with short excerpts. And, I am undecided if I will switch this blog over to WordPress. So anyway, have you heard about the 2012 syndrome? By the way we got slammed with snow the last week and now it all melted in last two days. That sounds like pretty amazing experience, the butchering. Great pic to go alone with it as well. Next post: A Slightly Extended Stay—Bulgaria. Previous post: The Snow has Melted.